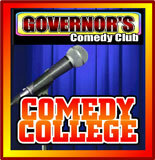 The Course Runs 8 Weeks culminating in a graduation show where you will perform 2 sets in two class shows right here on Governor's @ McGuire's stage ! You will learn all the basics including writing material, presentation and delivery, dealing with the crowd, emceeing shows, comedy club etiquette and also the business of standup comedy! We work with each person individually to enhance their strengths and eliminate their weaknesses and we answer any questions and address any topics which the members of the class may bring up as well!